Dell will release two new touch-based computing devices next month, the XPS 11 2-in-1 convertible and the Venue 11 Pro Windows tablet. Both products attempt to offer the best of both worlds — a tablet for portability with the option of a keyboard for getting real work done — but take different approaches. The Venue 11 Pro is a tablet that can attach to two different types of keyboards, though they're add-on accessories. The XPS 11 looks like a laptop, except the screen flips around 360 degrees (just like the Lenovo Yoga) to go into tablet mode. Each approach has its pros and cons. 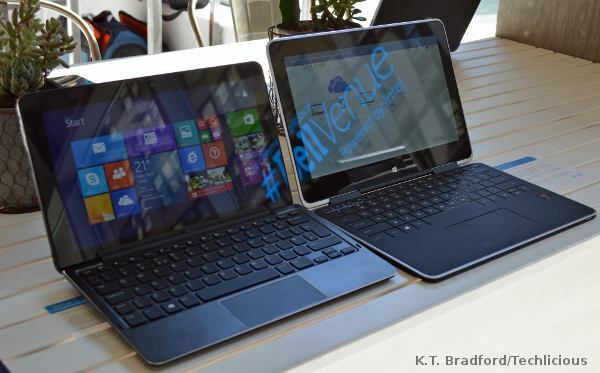 Which is the better tablet/ultrabook for you? Let's compare. People looking for a more laptop-like experience may lean toward the XPS 11 by default, since it looks more like one. The XPS has almost everything you'd want in an ultrabook: sleek design, light weight, just enough ports and a beautiful touchscreen. Another bonus is that the display has a very high quad HD (2560 x 1440) resolution — almost as high as the 13-inch MacBook Pro — that make movie watching a pleasant experience. Fonts stay crisp even at small sizes, and sizes are small. That resolution on this size screen means that desktop applications may have tiny interface elements (text, icons, etc. ), and you might need to tweak the settings unless you plan to spend a lot of time squinting. This may not be a problem when the XPS 11 actually comes out, but it was something I noted during my hands-on time with the demo models. Squinting is a minor issue when compared to what's going on with the keyboard. Dell decided to ditch the traditional keyboard and go with touch keys on the XPS 11. It's almost identical to the Touch Cover for Microsoft Surface tablets — you tap instead of pressing down on the keys — right down to the touchpad underneath. A rubberized matte coating makes this experience less unpleasant than it could be. It's still not as comfortable as typing on a real keyboard. During my initial tests, I noted a lot of dropped letters even when I typed deliberately. Plus, this keyboard was clearly not designed for people with long fingernails; it works if you have them, but typing feels terrible. 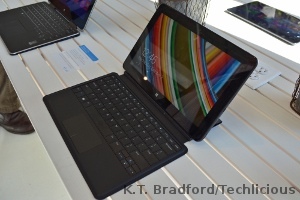 Dell wants you to think of the XPS 11 as a tablet-first experience, with the keyboard being secondary. If you don't plan to do much typing, the device's other virtues might swing you. The device is plenty powerful thanks to the fourth-generation Intel Core i3 and i5 processors, and it should get long battery life thanks to the efficiency of these chips. The solid state drives inside will also keep things snappy; you can choose 80GB to 256GB internal storage options. And though the XPS 11 is an 11.6-inch system, it's not so heavy. Still, it's weightier than a real tablet like the Dell Venue 11 Pro. 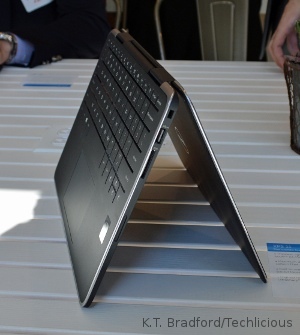 The Venue 11 Pro has a 10.8-inch display, very close to the size of the Surface 2 and Surface Pro 2. By itself, it weighs 1.6 pounds, almost a pound less than the XPS 11. It's also more versatile in some ways. As a tablet, the Venue is comfortable to hold and balances well for its size. There's a significant difference between using an 11.6-inch tablet and a 10.8-inch one. The latter is more easily held, carried and maneuvered. The Venue is a great ambassador for this point — more so than the Surface 2, which still feels chunky and inelegant in its second generation. Even though the screen can't boast a super-high resolution, full HD (1920 x 1080) still gives you a great experience whether you're kicking back and enjoying entertainment or getting work done. Like the Surface tablets, the Venue works with several accessories. There's a dock for connecting it to monitors and peripherals on a desktop. But this is a device made for portability, so the keyboards are far more interesting. The Mobile Keyboard is of the type that turns a tablet into a more laptop-like machine. This keyboard base includes a touchpad and an extra battery that Dell claims will double the time you can spend away from an outlet. No extra ports, which is a bummer since the Venue 11 could use them. The keyboard here is traditional and far more comfortable to type on than the XPS 11's. The base does add significant heft, and overall the two together felt like they weighed a bit less than three pounds. The Venue 11 is chunkier and a little heavier, without the same sleekness as the XPS 11. Still, typing on it is so much better with the keyboard base that it's worth the extra weight and girth. A keyboard cover similar to the ones made for the Surface tablet is available for people who need to do serious typing but want to maintain the light weight. Here again, the keys do press down like a traditional keyboard. They feel plastic under the fingers and travel is shallow — fine for occasional use, but not good for writing the Great American Novel. Last up is the Venue's active stylus. This add-on isn't included by default (the price isn't yet set), and so the Venue can be excused for not including a port to slip the stylus into. The stylus is the size of a real pen and feels good to hold and use. It remains to be seen if artists will prefer using this to the pen that comes with the Surface Pro; they use different technologies. For writing and handwriting recognition, Dell's appears to work well. The Venue 11 Pro offers a large number of configuration options, including five different processors ranging from Intel Atom (mostly found in netbooks) up to Core i5, four SSD sizes and optional mobile broadband. Though the Dell XPS 11 does a neat circus trick, it doesn't come off as either a great laptop or a great tablet. The Dell Venue 11 Pro appears to play both roles equally well, depending on the accessory. To top it off, it's potentially more affordable. The XPS 11 starts at $999. The Venue 11 Pro starts at $499 (for the Atom version; Core i pricing hasn't been announced). Given the announced price of the Surface Pro 2, I suspect that the models with the more powerful processors will probably cost at least $800 to start. 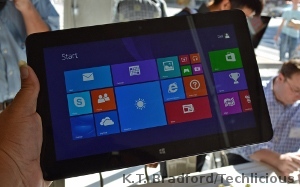 Dell may get aggressive on the pricing to better compete with Microsoft's tablet. Remember that the keyboard docks/covers cost extra. Again, Dell isn't saying how much right now. Both devices come out next month, before holiday shopping gets underway in earnest. do you have any idea where are the vents for fan in xps 11? is it fanless? Yep, the XPS 11 is fanless. vents in the Venue 11 Pro? Are there vents or perforations on the sides of the Venue 11 Pro (atom, i3, and i5) that may suggest that fans are cooling the processor? I saw and tried the surface pro 2 at a microsoft store. It has vents, and has a fan inside. Surface Pro have vents because it has a processor ending with U.
Venue 11 Pro and also XPS 11 has processor ending with -Y, sorg lower TDP. So they are fanless with no vents.